Personal notes and excerpts from the article. Who signals “noxious” and therefore “induce pain” in migraine? Activation of nociceptors induces pain – where are are the nociceptors located? Which head parts actually hurt? Let us ask again the question (as in the previous post further down this page): which structures of the head hurt in a migraine? And now let us ask the question: who signals “noxious” and therefore “induce pain” in migraine? At that time the only known pain signaling molecule was Substance P.
It was put to the trial and failed. Edvinsson, of Lund University in Sweden performs a screen. He takes blood from the jugular veins of patients who went to the ER for severe migraine and measures different peptides including Substance P during and after the migraine crisis. 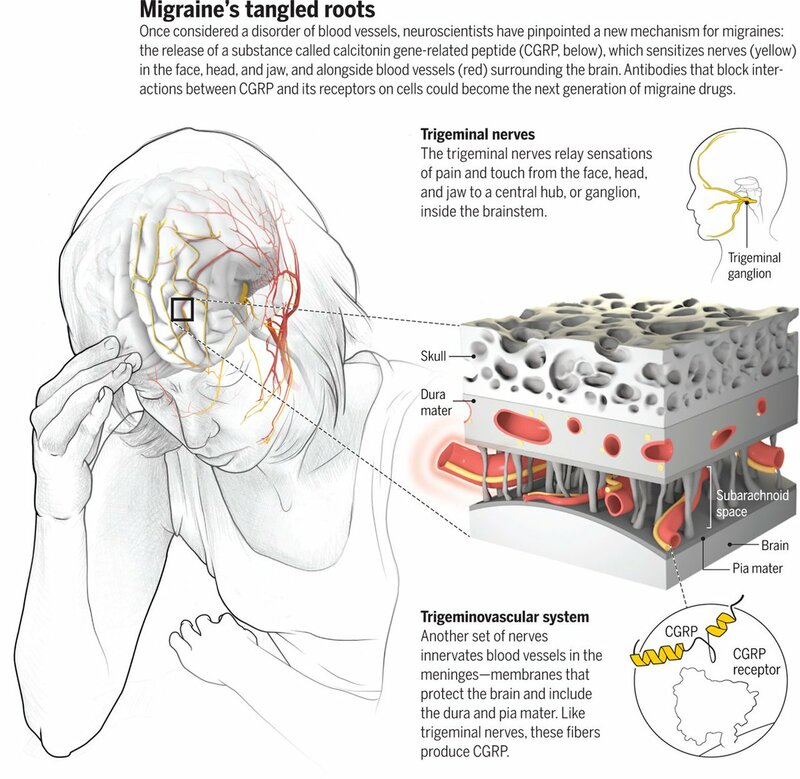 As CGRP emerges as a very significant candidate for migraine pain, intense efforts for a treatment that neutralizes its effect are currently underway as described in the article. Headaches: related mechanisms are electrical defects in proteins channels (migraine), vasculature mechanical impact, inflammation, muscle contraction (tension), traction. Headache: Which parts of the head ache? Those that have receptors for ache, for pain. Why does pain exist in general? Imagine that we see a nightmare and we bang our head on the wall. In the absence of the feeling of pain, we could continue banging it and cause serious head damage. In order to avoid harming our head, receptors for harmful stimuli called nociceptors (nocere=to harm) will pick up the mechanical impact and inform our brain. As mentioned in this NIH source at the section “Why Headaches Hurt”, nociceptors exist at the nerve endings of branches of the trigeminal nerve (nerve V), one of the 12 pairs of cranial nerves that start at the base of the brain. It is called trigeminal because it has three major branches that cover the areas shown in this picture. Not at all. Picking on the brain tissues or even cutting does not cause pain. What are the structures surrounding the brain? As this reference says: "The meninges PAD the brain." -- Pia; Arachnoid; Dura. In order to protect the brain, you would place it in a rigid box; that would be the cranial box. But you wouldn’t want to have it banging on the walls of this box. This is why you put a liquid cushion around it: you create a tank of liquid at the base of the brain and you connect to it a canal that goes around the brain. Here is the so called, ventricular system, a set of four interconnected cavities (ventricles) in the brain, where the cerebrospinal fluid (CSF) is produced. How do you do get the liquid, the cerebrospinal fluid, to be present around the brain? You put a thin membrane like a stocking around the brain; this would be so subtle and tight so as to cover every little detail of the surface of the brain. This is called the pia matter. Then you put a less tight membrane around it, which fits loosely like a bag. This, due to its spider-web like appearance, is termed the arachnoid matter. In the space between the two (found under the arachnoid and therefore called subarachnoid space) circulates the cerebrospinal fluid. This somehow fragile configuration must be attached to a more solid membrane that will connect it to the skull. This would be the dura matter, which is relatively solid and constricts the movements of the brain in order to protect it. "1317 CFS Circulation" by OpenStax College - Anatomy & Physiology, Connexions Web site. Blood vessels and capillaries go through the pia matter. There is something special about the walls of these capillaries. The endothelial cells that make up their walls are bound together more tightly using specific junctions. In this way they create a barrier between the bloodstream and the brain tissue which is called the blood brain barrier. This is also strengthened by astrocytes that place themselves on epithelial cells. The blood brain barrier was discovered when a blue dye was injected in the circulation of mice and it would not color the brain. Similarly, neurotoxic agents injected in the circulation would not cause damage to the brain as they could not pass the blood brain barrier. However, if these were injected in the cerebrospinal fluid circulation they would have access to the brain and would therefore damage it. The dura matter is associated with dural venous sinuses, which are venus channels that receive blood from brain veins and cerebrospinal fluid from the subarachnoid space and empty in the jugular vein. Also the dura has folds, such as the tentorium one which separates the cerebellum from the rest of the brain. As mentioned in the book "Guyton and Hall Textbook of Medical Physiology, 13e (Guyton Physiology), John E. Hall PhD", if you stretch the dura at the base of the brain, damage the tentorium or pull on the venus sinuses you cause headache. The same occurs if you manipulate the vessels of the meninges, e.g. stretch or damage. One of the most intensive headaches is caused by meningitis, which causes inflammation and therefore damage of the meninges. Stretching of the dura can occur if the volume of cerebrospinal fluid is reduced for example by 20mL, especially if a person is in the upright position, because it is as if the weight of the brain falls onto the dural. One of the most important headaches due to intracranial structures is the migraine. The exact mechanism of pain is unknown. Here is some information on the general migraine mechanism. A defect in a protein channel that handles ionic and therefore electric currents can trigger an electrical activity thunderstorm whose electric front moves with the speed of 2-3mm per minute on the cortex, the top slice of the brain. This turbulence causes depressed activity of the cortex (cortical depression) spreading as mentioned above. This phenomenon affects the vasculature and stimulates the trigeminal nerve thereby causing pain. As the wave moves over the visual cortex area, different visual phenomena occur. Picture source. Schematic views of cortical activity in the human brain in the human brain. Top row is time series of CSD adapted from Lauritzen (1987) with permission. Bottom row is the same phenomenon assuming a much weaker excitability, i.e., lower susceptibility for CSD (Dahlem and Müller, 2003). Let us restrict ourselves to the scalp, which is the soft tissue that covers the cranial vault, the part of the cranium that is occupied by the brain. Where do we have muscles on our scalp? We can try to find out for ourselves by trying to move different parts of the head or by thinking what purpose would the muscles serve. We need to turn our neck, move our jaw and our eyes. These functions seem to cover the front, the back and the side but not really the top of the head. In accordance with this, we do not have muscles on the top of the head, but a tendon-like structure, an aponeurosis, termed epicranial aponeurosis or galea aponeurotica. The frontalis muscle that starts from the dermis of the skin of the eyebrow region and the bridge of the nose. The occipitalis muscle that starts from the neck. 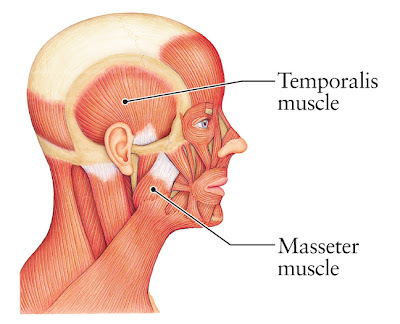 The temporalis muscle on the side (necessary for jaw movement). These muscles connect with the epicranial aponeurosis, a tendon-like structure on the top of the head. As mentioned in the book, Guyton and Hall Textbook of Medical Physiology, 13e (Guyton Physiology), John E. Hall PhD, emotional tension often causes many of the muscles of the head, especially the muscles of the scalp and neck to become spastic and this is hypothesized to be one of the common causes of headache. Also irritations of the mucosal membranes of the nose and the nasal sinuses can trigger headaches. Additionally, difficulty in eye focusing can put a strain in the eye muscles and cause headaches. The same is true for excessive irradiation e.g. UV sun rays.